398 pages | 39 B/W Illus. The seventeenth edition of Party Politics in America continues the comprehensive and authoritative coverage of political parties for which it is known while expanding and updating the treatment of key related topics including interest groups and elections. Marjorie Hershey builds on the book’s three-pronged coverage of party organization, party in the electorate, and party in government and integrates contemporary examples—such as campaign finance reform, party polarization, and social media—to bring to life the fascinating story of how parties shape our political system. Fully updated through the 2016 election, including changes in virtually all of the boxed materials, the chapter openings, and the data presented. Explores increasing partisan hostility, the status of voter ID laws and other efforts to affect voter turnout, young voters' attitudes and participation, and the role of big givers such as the energy billionaire Koch brothers in the 2016 campaigns. Critically examines the idea that Super PACs are replacing, or can replace, the party organizations in running campaigns. New and expanded online Instructor's Resources, including author-written test banks, essay questions, relevant websites with correlated sample assignments, the book’s appendix, and links to a collection of course syllabi. Why should you use this book to guide you in the search for understanding democratic politics in America? The short answer is that this book is the best guide you can have. This new edition of Party Politics in America continues its tradition of combining the most comprehensive coverage of scholarly research with an up-to-date treatment of the rapidly-changing party and electoral landscape. The 2016 election cycle has produced more drama and change for American parties than any in decades, and Marjorie Randon Hershey chronicles it especially well. Between its readability and stellar integration of scholarship and current politics, this book will appeal to students and instructors alike. I look forward to using it in my course, and to learning from it in my own research. In the midst of unprecedented events and personalities in American politics, one thing remains unchanged: Party Politics in America is an unparalleled resource for understanding the central role of political parties in American democracy. 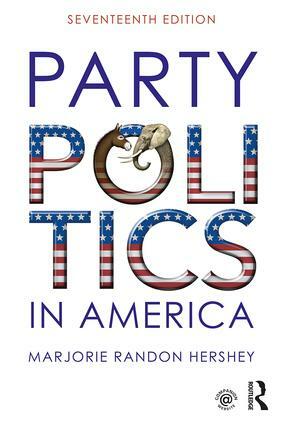 With clear, accessible language and organization, Marjorie Randon Hershey covers every aspect of American party politics in a way that enables readers to make sense of and identify patterns in what appears to be a messy, even irrational, system. This text continues to be the gold standard for courses on American political parties. In clearly written and engaging prose, these chapters reflect enduring wisdom alongside newly developed analytical insights from the best scholars. Marjorie Randon Hershey also does a wonderful job of contextualizing parties in the American political climate, documenting the challenges they face, and pointing out the myriad ways parties structure and influence behavior and policy. 1. What Are Political Parties? Marjorie Randon Hershey is Professor of Political Science at Indiana University, USA.